Lehman College celebrated Earth Day 2013 with a series of activities aimed at promoting ecology on campus and beyond. In this video, students CC McMillian and Troy Thompson (class of 2014) explore the best practices for environmental conservation while discovering yoga and healthy living. 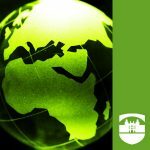 Hosted by the Lehman College Sustainability Council, the event seeks to raise environmental awareness. “Strides in Sustainability” takes you through the Bronx’s journey toward energy efficiency in its new buildings and transportation systems and explores some of the environmental efforts underway on the Lehman campus as well as in the borough.